If you’ve never heard of a computer corporation called Compaq and you’re using some kind of portable computer device (yes, a smartphone counts), then you may find “Silicon Cowboys” interesting. If you’re a child of the 80s, yet have only a vague recollection of the impact Compaq had on the burgeoning use of personal computers during that decade, like me – then you may find Jason Cohen’s documentary on the rise, success and demise of Compaq quite fascinating. If you’re savvy on the history of computers, it’s possible you may know everything this film covers, but you’ll smirk at how commercial advertising for computers have changed. If you’ve been watching the AMC television series “Halt and Catch Fire”, which focuses on the personal computer revolution, set in the Silicon Prairie of Texas in the early 80s, well then “Silicon Cowboys” will enlighten you. On September 1st, 1981 in Houston, Texas, three ambitious senior managers from Texas Instruments – Rod Canion, Jim Harris and Bill Murto – decided to quit their stable jobs and form a company together. They just weren’t sure what kind of company. For a hot second, they thought maybe they’d open a Mexican restaurant, just because that’s the kind of food they would brainstorm over, but thankfully they remembered it’s best to go with what you know. Little did they know that by deciding to take on what IBM was doing with computers and form a company called Compaq, that would eventually create computers with a handle (that would weigh about 28 lbs. and look like luggage) that could be carried anywhere and transform the digital landscape forever. In fact, their goal would be to create such a computer that would be compatible with IBM software (albeit through morally suspicious reverse-engineering). It seems archaic to think about now, but there was a time when this line of thought was ground-breaking. Cohen’s film covers the birth of Compaq, by including the three founders in talking head interview snippets, as they recall where they were at back in the early 80s and how they came to form one of the most successful computer companies at the time. These werent arrogant power-hungry capitalists, who were in it for the money (well, that last part is probably right, although they deny it here), these were men who wanted to claim something of their own that could be used by anyone. The Texas trio aren’t the only ones we hear from though. Cohen includes several former ground-level Compaq employees as well and he does something quite clever too – whenever screen time is given to a former employee, a photo ID badge pops up on the lower right-hand corner of the screen with their name, so we know who’s who. It’s a nice touch which differentiates itself from the countless docs out there with talking heads and its funny too since the photos are what they looked like back in the early 80s. None of these guys had tech giant IBM (known as the Big Blue, for their recognizable blue-lettered logo) in their crosshairs, they just wanted to make a product that could call their own. Although Canion, a scientist and businessman, was the ersatz general manager of the trio, the humble geek knew very little about speaking in front of people, let alone being the face of a company. He was helped and eventually mentored by Ben Rosen (who also appears in talking head clips), who would provide the initial financial capital to get the company going and would go on to become chairman of the company. Canion, Harris and Murto fostered a work environment that was down-to-earth and accommodating to their employees, offering free coffee and soft drinks in a campus-environment location that was surrounded by trees. Before the company would expand to 900 or so employees with all their success, those who were employed there early on felt they were working in an environment that respected and appreciated them – they even felt their opinions about the product they were making mattered to the higher-ups like Canion. “Silicon Cowboys” tracks how Compaq miraculously rose to the success it would be known for. In the company’s first year of sales, it sold 53,000 PCs for sales of $111 million, becoming the first start-up to hit the $100 million mark that fast. When Compaq went public in 1983 on the NYSE, it raised $67 million. It enjoyed record sales of $329 million from 150,000 PCs in 1986, eventually becoming the youngest-ever firm to make the Fortune 500. In 1987, Compaq hit the $1 billion revenue mark, taking the least amount of time to reach that milestone. Obviously, this changed many of the employees lives, finding them driving around in fancy sports cars and going from fast food and a coke to salmon and some wine. The film covers how serious Compaq took compatibility and the lengths the would go to advertise and hype their product. While other companies hired William Shatner or King Kong Bundy to promote their computers in the 80s, “Silcon Cowboys” reminded me how great those Compaq commercials were with John Cleese. There were many of them, but in one particular commercial, Cleese compared a Compaq Portable 2 computer with a dead fish on a plate. It would’ve been great if Cohen had been able to interview Cleese for the film, asking his thoughts on those commercials and what convinced him to take and continue to do the job (besides money), but alas, he’s not found here. These ads were a runaway hit. Apple may have had their memorable MTV-esque Orwellian Big Brother commercial which introduced their Macintosh computers, but Compaq had John Cleese just being John Cleese. You can’t go wrong with that. But, the main reason Compaq wasn’t threatened by Apple is because their product was compatible, whereas Apple was creating product that was exclusive – they still are, only now everyone accepts the Apple-exclusive product. 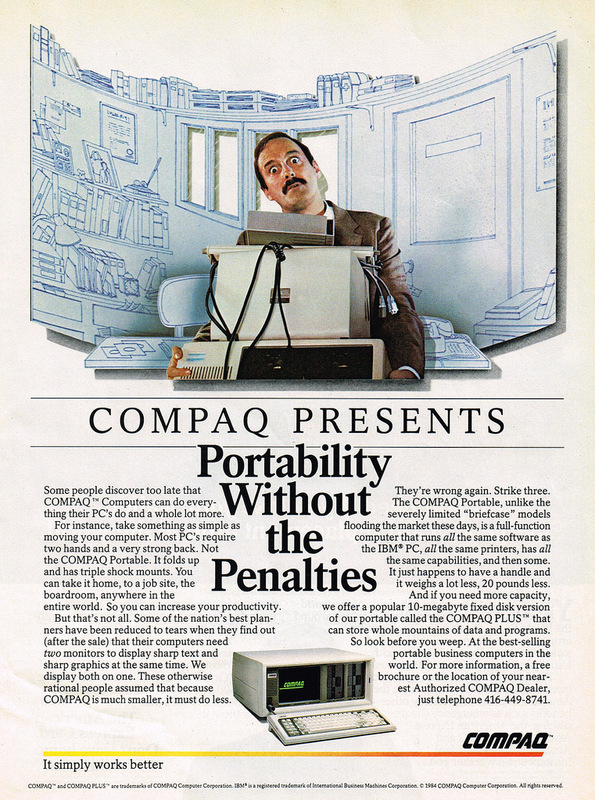 But back in the 80s, not even Steve Jobs’s Lisa could compete with what Compaq was doing with their portables. Like Apple, Compaq knew that making announcements about new products should be an event. Soon they had the likes of David Copperfield, Irene Cara and The Pointer Sisters (dancing on a stage that illuminated a keyboard, no less), performing and singing (respectively) at their launch events. It may be humorous now to hear about the Compaq products offered, like the Compaq Plus, which stored 30 times more information and the Compaq DeskPro 286, which had a maximum RAM capacity of 14 megabytes. It was so successful that people started asking, “What happened to IBM?” Compaq’s slogan,“It simply works better” was resonating. The whitest and most bizarre moment in of the doc occurs in the middle, where we see a video that finds Rod Canion rapping to a tune called PAQRAP. It’s awfully white, pure 80s and completely steals the “Super Bowl Shuffle” riff from the 1985 Chicago Bears. Thankfully, the whole video is not shown and Cohen (who earned an Oscar for his 2013 live-action short “Facing Fear“) moves on to other distinctively 80s moments. Of particular note are all the magazine ads for computers back then – so dated and so cheesy. It’s amazing what compelled consumers to bite (or should I say, byte? ), besides the peer pressure of keeping up with the Joneses. Like so many documentaries about start-up companies or even dedicated/obsessed businessmen or artists, there comes a point in the doc where the peppy music gets grave and it becomes obvious we’re going to walk through the dark valleys of this journey. This is where we’re told that the supply and demand of it all took quite a toll on the social or family life of the trip and other employees. Families split up, as they do and regrets were made. For some, it caused them reassess their lives and even retire. Throughout “Silicon Cowboys” there are clips from ABS News, CNN and The Computer Chronicles (a dated personal computer show) as well as computer historians and Christopher C. Rogers, one of the creators of “Halt and Catch Fire”. We see the media covered their every move, in much the same way Apple or Microsoft is covered now and we also see how influential Compaq was. Toward the end of the film, we learn how powerful and aggressive IBM had become, especially toward their competitors with their high-priced lawyers. Cannon became involved in an Anit-IBM lineup that included Compaq, NEC, Zenith, Hewlitt Packard, Tandy, AT&T as well as Bill Gates and their steps toward confronting IBM became even more like a David vs. Goliath story. Eventually, Compaq dissolved and was acquired by Hewlett Packard, but it’s obvious that “Silicon Cowboys” was made to remind or educate viewers how the company altered the future of personal computing as we now know it. It may seem like much has changed since the 80s PC Wars, but it really hasn’t. There are still long lines of people waiting outside Apple stores (regardless of the weather) for the latest iPhone – just as they did for the newest product from Compaq.